If you are like me, you would be a working professional pumping in 12 hours a day at work, not because you love it, because you are *required* to do it. Also, you would be living in a different city away from your parents with your wife and kid. Basically, you would be a working professional living in a nuclear family managing your household stuff yourself. I pay my mobile bills online. Broadband dongle, Property tax, Electricity Bills, EMIs and practically everything, that can be done online is done online. Simply because, I don’t have time! Similarly, I live a comparatively active social life. I am on Facebook, Twitter, Flickr, Foursquare among others. I have an Ovi account (eeesh, I use a Nokia…… still!). And then there are Netbanking and stuff. It sometimes becomes impossible for me to remember all my usernames and passwords. Especially for Electricity bills or other bills which I probably need to login once a month. I needed a strong wallet application. Something which would remain with me beyond my E72! I am a happy Quickoffice customer. Been using Quickoffice 6 since long, recently purchased Quickoffice expense and both have never ceased to amaze me with their *simply works* ease. So naturally, I went to the site for the Wallet application as well. I saw SPB Wallet in their app store at 50% discount. SPB are a fantastic bunch of people. Consumers using Nokia’s touchphones would have found it very hard to resist their SPB Mobile Shell App. I bought that at $14.95. I have been using that app for the past three 3 days and absolutely digging it. Everything at your fingertips. When you download the application from the link provided in the mail the comes to you after the purchase, it goes into your applications/My Stuff folder. When you click, it will ask for a password. 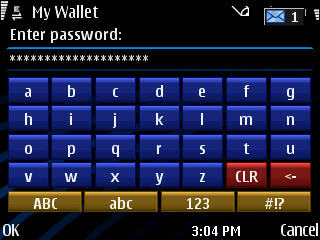 You can feed in a password through the phone qwerty or the app’s qwerty. My suggestion is to keep it real strong. Once you feed in the password, you are taken to the main screen. 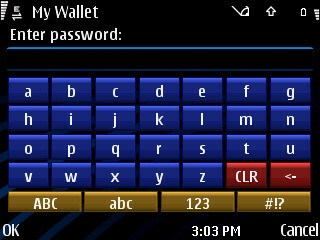 Here you start putting in your usernames and passwords corresponding to the headings. It makes life real simple. For example, all my emails and social media and utility bills usernames and passwords are saved in Computers. It becomes easier for me to organize it that way. 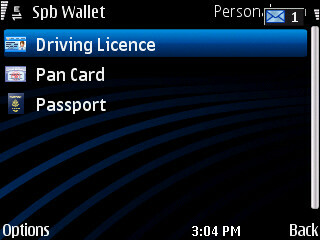 Then I can have my cards sorted out under credit cards and Personal can have my Driving Licence etc details. 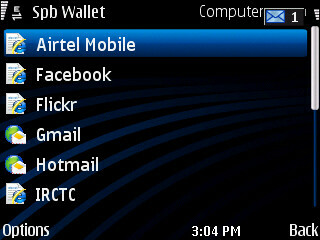 There are many wallet applications available. 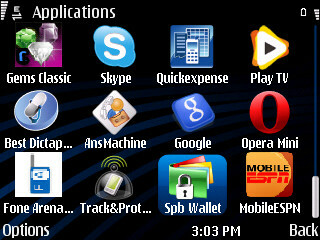 You have Smartphoneware’s Best Safe, Epocware’s Handy Safe pro and Quickoffice’s QuickID also. Though I am not that kind of managed person and love to keep the mess around but may be such posts will inspire me to be a little more managed. Now you are married and now the responsibilities will be increasing. 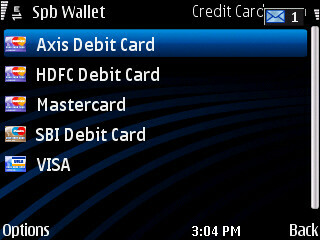 It’s good to have a wallet application. More so, if you have 2 or more bank accounts and debit and credit cards. But then, yes, it’s all about the current need and preferences! Does this app has any option to take backup? Hi Arjun. It will have your data synced with your PC. Am not too sure what back up you are enquiring about. All your data in the app will be there on the computer. If you are asking about phone data (total phone data and not just the app’s data), I am afraid, it won’t be able to do that! When you take the back up of the data before the FW update, this also gets backed up! However if you want to install fresh, all you have to go, just sync the data with your outlook or web integration. It’s always there! Does the wallet data sync with outlook and SPB Online wallet? Ak, did you try handy safe before? and $15 include desktop client as well? can we have more than 1 desktops/laptops? Yeah I prefer handy safe, As it has a separate desktop client. Where you can enter the details in the desktop client and then sync with the mobile. I will update my comments tomorrow as early as possible! Arjun, I was thinking of getting such app and choice was between SBP wallet and Handy safe pro.I asked AK , some questions also. Then , I saw Handy Safe Pro on Ovi Store for AED 5, Rs. 62 may be. So i thought to give it try. I knew that I am getting phone only app. But I assumed (mistake ) that it has web sync support. i found that It doesnt have it. I would rather prefer web sync over just pc sync, actually having both will be great. 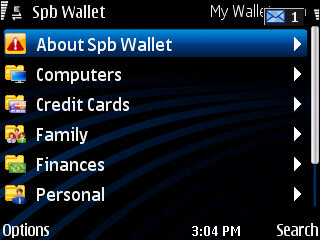 But thats reason , I am now thinking of getting SPB Wallet. I dont see any other major differences. You can check another option here called Safewallet by SBSH, thats $6 with PC app Vs Handy Safe pro which is just mobile app and desktop you need to purchase separately. check these links. This guy has done good comparison.But misses huge advantage of SPB wallet thats web sync. 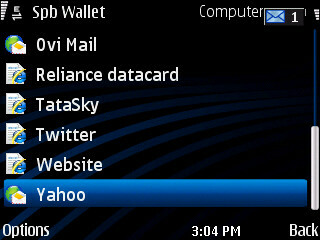 and you can see Safewallet here. ha ha! Ofcourse, something like this makes perfect sense for you! Give it a spin!! 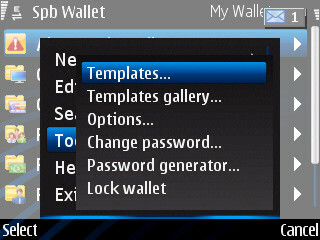 I am using 15 day trial of SPB Wallet and it works well on N8 , so should be no issue with other S^3 phones. PC and phone sync works well. It has very good options so many templates and toolbars for IE and Firefox. so you intend to invest $25 for the entire mobile and PC suite combined? Yes. With your post I kind of got idea how useful this or such app can be in life.I will use trial for few more days and then get it.